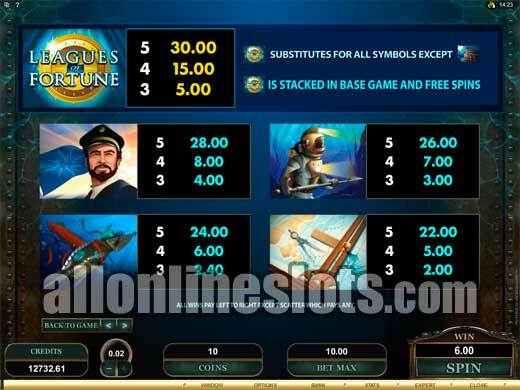 Leagues of Fortune is a Jules Verne inspired video slot from Microgaming. It uses the 1024 ways format with a 4x5 reel layout and has stacked wilds on all reels. 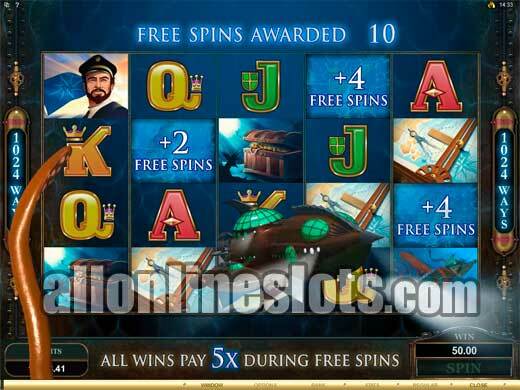 Win free spins with all wins multiplied by X5 or try your luck with the Your Gamble option. 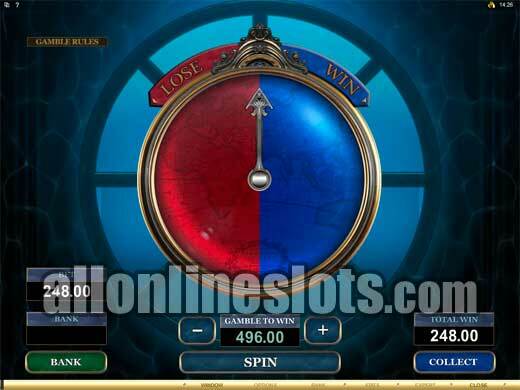 Leagues of Fortune is a Microgaming video slot with 5 reels and 1024 ways to win on every spin. 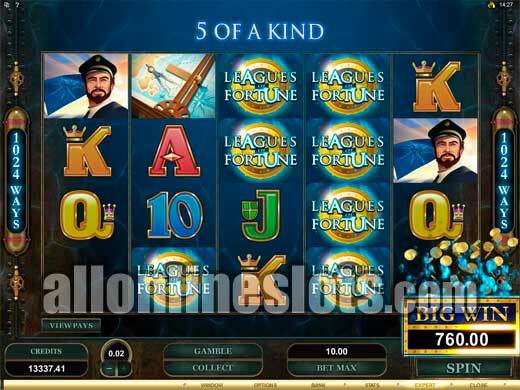 The game uses the 4 x 5 reel layout and features stacked wilds, free spins and the Your Gamble double up option. The game is clearly inspired by the Jules Verne novel 20,000 Leagues Under the Sea. You can play Leagues of Fortune in two coin sizes (0.01 or 0.02) and a bet of 50 coins is required to have all ways active. YOU can play up to 10 coins per way which means all wins are multiplied by 10. Max bet is either 5.00 or 10.00 depending on coin size. The Leagues of Fortune symbols are wild and appear stacked on all reels. 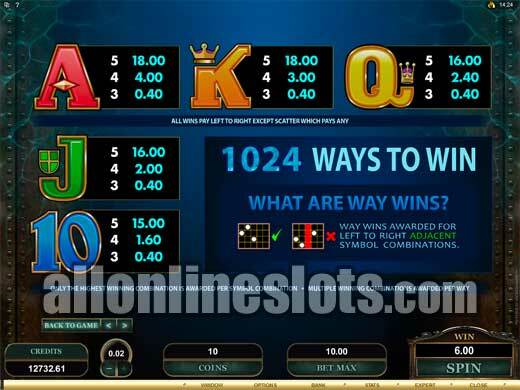 Getting five wild symbol on a single way pays 150 coins or 1,500 coins at max bet. 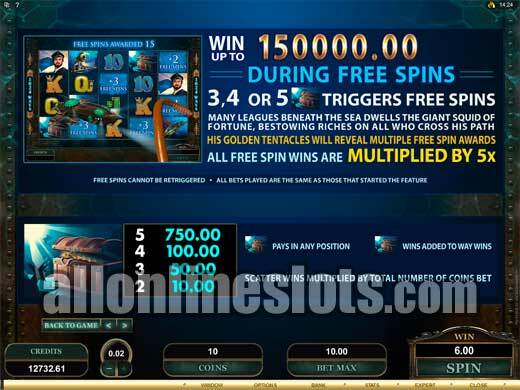 You can however get a whole screen of wilds which turns this relatively small jackpot into a huge 153,600 coin win at one coin or a massive *1,536,000 coin win at max bet. Of course there are lots of other wins in addition to the top jackpot. The rest of five of a kind pays range from 140 to 75 coins. Again while these are small pays you can get stacked wilds on some reels and then get the same win on a lot of different ways in a spin. The Treasure Chests are scattered and are your ticket to the games biggest possible pays. Getting three or more starts the bonus where instead of winning a set amount of free games there is a twist. The creature of the deep appears and smashes symbols positions to reveal your free games. The worst we had was 8 and the best was 22. 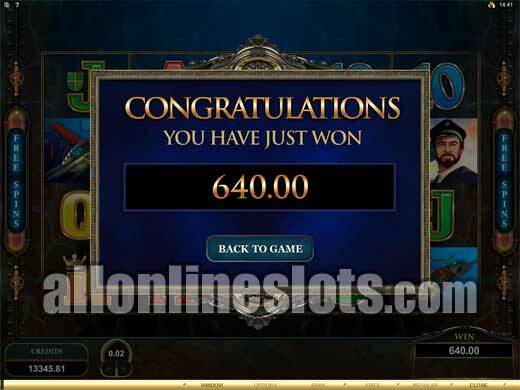 During the free spins all wins are multiplied by 5 which boosts the top jackpot to a very impressive 768,000 coins at one coin and an even more impressive 7,680,000 at max bet. Even at the 0.01 coin size this pays 76,800 if you're betting max. 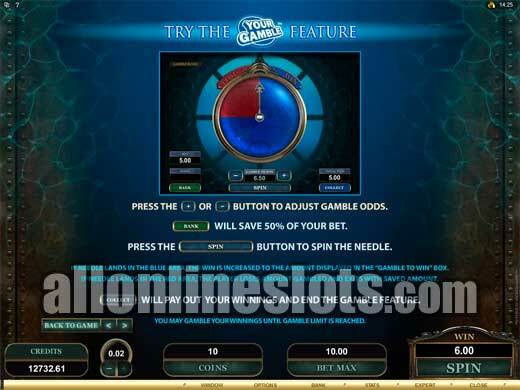 As well as all of the ways to win on the reels, Leagues of Fortune also has a gamble option known as the Your Gamble feature. This bonus was first seen on the Untamed series of slots and gives you a new way to try to increase your winnings from the reels. Select the odds and spin the wheel to see if you're a winner. 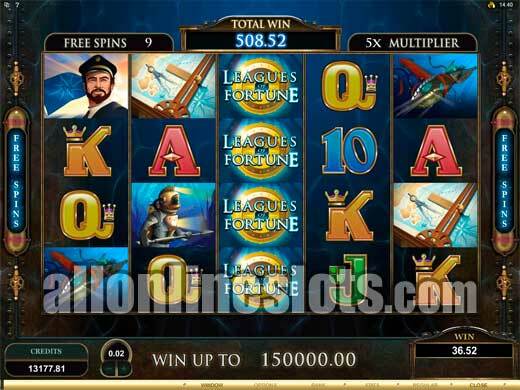 In the end, Leagues of Fortune is a great addition to the Microgaming slot range. We love slots with stacked wilds so to have stacked wilds on a 1024 ways game really gives you some massive jackpot chances. 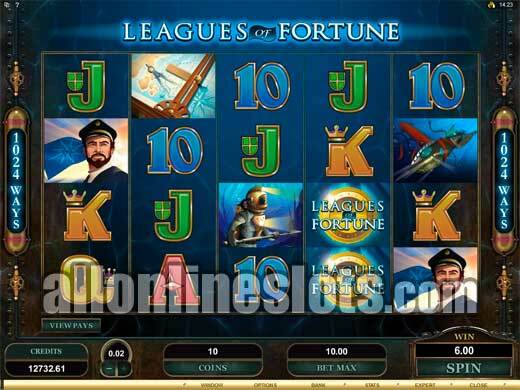 If you're a fan of multi way video slots then Leagues of Fortune is a game you really have to check out.